Thirteen year old Ryanne, who is confined to a wheelchair, lives quietly with her Aunt, who has cared for her ever since her mother died. Her father, who has become rebellious, stays away from home as much as possible trying to forget everything. Tha often makes Ryanne sorrowful, despite the fact that she knows that the Lord can do everything. He alone can make things well. But soon it seems as though the opposite is true, when she hears that she will get a new mother and a new sister. She does not want this to happen. A difficult time is ahead for Ryanne. Her quiet life is about to be disrupted. How will everything ever be well again, she wonders? Ryanne does not know. All will be well, but how? 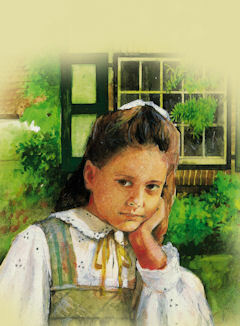 In this book we also meet Lydia, the main character in The Father of the Fatherless.